This is the second volume in the Otherland series, and, just as the first one was entertaining and interesting, so was this one. The stories of Renie and !Xabbu, Orlando and Sam, Paul, Dread and Jongleur continue, and are joined by a few other protagonists. Now trapped in the Otherland network – a series of ultra-realistic virtual realities linked by portals – the first four of the protagonists mentioned above flounder about, get separated from their companions and slowly start to piece together the purpose of Otherland. The bad guys have their own problems as the network displays signs of instability, but this side of things is not given much page time. 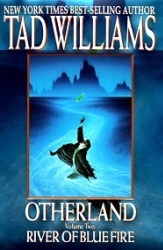 Dread becomes a murderer in the network as well as in real life, but the identity of his avatar is concealed from the reader, making this book into something of a mystery novel. This book continues the good work of the first, so there isn’t really much for me to add beyond what I wrote a few weeks ago about City of Golden Shadow. Throughout the course of volume two, the characters slowly start to find their feet and, by the end of it, you get the feeling that they will start to be the masters of their own destinies in book three.